Editorial I am delighted to introduce the first issue of Mission 360°, an exciting magazine dedicated to a complete focus on Adventist mission. 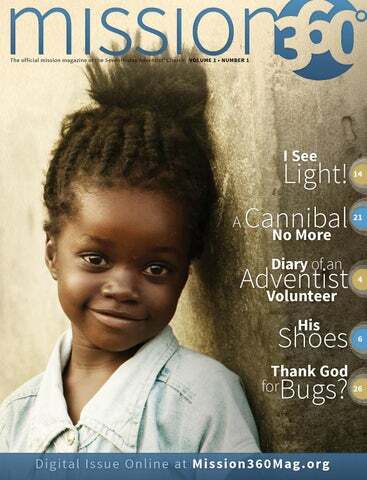 Mission 360° is a quarterly magazine produced and copyrighted ©2013 by General Conference of Seventh-day Adventists. All rights reserved. The contents may not be reproduced in whole or in part without written permission from the Publisher. 12501 Old Columbia Pike, Silver Spring, MD 20904-6601, USA Telephone: (301) 680-6005 Email: questions@mission360.org Volume 1, Number 1 ADVENTIST and SEVENTH-DAY ADVENTIST® CHURCH are the registered trademarks of the General Conference of Seventh-day Adventists®. Frenita Buddy (right) enjoying an outdoor adventure with new friends. people from Puerto Rico, Mexico, Brazil, South Africa, Sri Lanka, Australia, Great Britain, the Philippines, America, and of course, Japan. I’m trying to learn to read in Japanese, but after a while things begin to look a little messy to my untrained eye. hike up at night to see the sun rise over the mountain. At church, I’ve joined the Japanese youth choir and the English-speaking church choir. It’s lucky for me that they practice at different times. Since arriving here, I’ve become a semi-regular watcher of sumo wrestling. posed to stand out. The only sound heard is the clack of the shoes on the pavement. I promise! It seems as if no one is talking to each other and no one is talking on the phone. 8:00 a.m. Walk from Harajuku train station to work. Dodge puddles of water on the way. Pass piles of Sakura Snow. (The cherry blossoms fall like snow and the petals create a delicate pink pile of beauty.) 8:10 a.m. Settle in and have my personal devotions and Bible study. 8:45 a.m. Begin writing scripts for Adventist World Radio. I’ve also helped translate some scripts. I usually simplify the English in other scripts so that it is easier to translate into Japanese. My co-host is Miyuki. 10:00 a.m. Have staff worship and get ready for classes. I’m disappointed to learn that I missed the last sumo competition of the year. I went with my house mother to watch the Japanese men’s volleyball team play in the qualification round for the Olympics. We had a great time! My house mother is the perfect, modest Japanese lady, but she turns into a spunky cheerleader when it comes to sports. Frenita with her house mother, Ayako. The people here are wonderful and kind. Each host is like a little grandmother, forcing you to eat. thanking God. Why? I had hoped to visit Thailand for my winter holiday, but it didn’t work out, otherwise I would have been there. Instead, I am spending the winter holiday with friends here in Japan and Okinawa. We’ll be going to visit some hot springs. I won’t leave until I look like a prune. I’ll be heading back to the States soon. How am I going to get a year’s worth of stuff in two suitcases and keep it under the weight restrictions?! Konnichiwa! It’s so good to be back home in the United States! But now I miss my friends and “family” back in Japan. I will think of them often, especially whenever I eat tempura or soba. The good thing is I’ve found a grocery store that sells a few Japanese items so I can keep enjoying the food I learned to love. Living in Japan was truly a remarkable and wonderful experience for me. Sounds cliché, but it’s absolutely true. I am very grateful for the blessings of friendship, hospitality, work, and the many lessons I learned while I lived there. Love and blessings, Frenita Frenita Buddy is Production Director for Hope Channel’s studios in North America. Hope Channel is the official television network for the Seventh-day Adventist world church. In the days right after my dad died we found an expression of his life on the floor of his closet: half a dozen pairs of shoes lined up in the order of their age, laces methodically tucked inside. by his trademark handwriting: David H. Baasch. I don’t know if at his death Mommy sent his shoes to Goodwill, the local community service center, or the janitor’s family he’d befriended. But I guess after he was gone, it didn’t matter who wore them. Because he had already walked the paths here at Brazil Adventist University, where Larry and I are studying for three weeks in preparation for mission service in Lebanon. In 1983, when the university was established, Daddy was an associate secretary for the Inter-American and South American divisions. This part of the world was his ministry, his burden. What an associate secretary does is just a small sliver of all that happens in the network of Adventist institutions and organizations, and most of it has to do with paperwork and editing, recruiting and processing. But his footprints are here with the people and countries he loved. And now I’m here too, following him. As part of our journey to Beirut, Larry and I have come to Brazil to attend a three-week conference hosted by the Institute of World Mission. The training will help prepare us for a new world. A new culture. A new way of living and working and appreciating. We’ll take in lectures, group discussions, reading, field trips—and who knows what else—to help prepare us for the transition. We are already grateful for the opportunity to set our hearts toward this adventure—and it hasn’t even begun! I’m personally relieved for the chance to get away from the lists of things to do, the appointments, and the goodbyes so we can take time to consider what we’re undertaking. This journey is both exciting and sobering for our entire family; we need the best support through the process. I feel I’ll be reaping the benefits of what concerned Daddy the most about his work: the precious families he sent out. I heard him worry about workers who had to leave their teenagers stateside; he knew what his invitation was costing “his” families. I saw him cry for the family of the bush pilot who flew a plane into a foggy mountainside; he felt the responsibility of recruiting a worker to a high-risk mission. He told us the story, his voice choking, of the mother who died in childbirth because she couldn’t get proper medical care in time: he wondered if she could have been saved if they’d airlifted her. he also invested himself in the very experience Larry and I are enjoying here in Brazil. He never knew what our family would need. He never knew we would benefit. He never knew we would follow the focus of his life. But he gave...and we’re receiving! Today is the 26th anniversary of his memorial service. Sixty-three is too young to die. But it’s not too short to be a powerful influence for a long, long time. His footprints are still pressed into the red soil of Brazil and countless other countries of the Americas. His life is still my blessing. His Shoes was written by Kathie Lichtenwalter while she and Larry were attending Institute in preparation for serving at Middle East University (MEU) in Beirut, Lebanon, where Larry is dean of the School of Theology and Philosophy and director of the Institute of Islamic and Arabic Studies. Previously, the Lichtenwalters served the Village Adventist Church in Berrien Springs, Michigan, where Larry was senior pastor for 27 years and Kathie had a violin studio and was active in church life. They have five grown sons and two beautiful daughters-in-law. Kathie’s parents, Iva and David Baasch. Kathie and Larry Lichtenwalter overlooking Beirut, Lebanon. name we’re giving to centers of influence that we hope to see in cities all over the world. It’s a concept that comes from Ellen White, who had a vision to “establish in all our cities small plants which shall be centers of influence.” The idea is simple—start wholistic ministry centers in urban areas to connect the church to needs in the community. Ellen White envisaged centers including things such as lifestyle education, treatment rooms, bookstores/ reading rooms, restaurants, literature ministry, lectures, instructions on preparing wholesome food, etc. M360: How big are Life Hope Centers? GK: Ellen White opposed setting up huge urban institutions that would tie up the c h u r c h ’s resources and personnel in just a few places. She felt that urban ministry should be distributed among many smaller centers. “It is through the social relations that Christianity comes in contact with the world,” she wrote. Life Hope Centers provide an opportunity for building that type of contact. She also urged Adventists to “strive to place themselves where they will come in direct contact with those needing help.” That’s exactly what Life Hope Centers do. M360: What sort of building does a Life Hope Center require? GK: In some parts of the world it may just be a rented room in a downtown area. In other places it may be more sophisticated. In some locations it might be a church hall. The shape or size of the center isn’t so important—as long as it provides a platform for reaching out and meeting the needs of the surrounding community. The idea is simple— start wholistic ministry centers in urban areas to connect the church to needs in the community. community and meet people where they are. U n f o r t u n a t e l y, many churches tend to spend more time and resources focusing on inward needs rather than on the community. A church that’s following Christ’s Method will focus outward, training and inspiring church members to mingle, show sympathy, meet needs, win confidence, and invite people to follow Jesus. If your church can do that, it can be a Life Hope Center. M360: How is the Office of Adventist Mission helping establish Life Hope Centers? GK: We’re providing some financial assistance, as well as on-going support for marketing, resources, and programming. We’re developing a smorgasbord of expertly designed curricula that Life Hope Center leaders can download free from the Web. They include seminars on everything from cardiac health to birthing companion training—complete with PowerPoint slides, teacher notes, work sheets, etc. We’re also adding many useful tools such as instructions on how to perform community assessment. There will be guides on how to plan various community events, and so much more. Everything can be adapted for the local context. provide an opportunity for involvement in ways that suit their gifts and interests. A church businessperson may never preach an evangelistic sermon, but she could run seminars on managing finances. Young people can run games and activities for community kids a few hours a week. The list goes on and on. M360: So Life Hope Centers will be involved in all sorts of good things, but what’s the ultimate goal? GK: We want every center to have a plan to connect people in the community to Adventist small groups and urban church planting initiatives. This is key. We’re not talking about just setting up more social service centers—as important as they are. Our care for the community is never conditional on people becoming Adventists—we’ll still mingle, show sympathy, and minister to needs even if people never show any interest in our beliefs. But it’s our goal to lead people to Jesus and to become baptized members of the Seventh-day Adventist Church. Gary Krause is an associate secretary at the Seventh-day Adventist Church world headquarters and the director of the Office of Adventist Mission. Meet Janie Yoo, an ophthalmologist serving as a medical missionary in Zambia. Clockwise from top left: Janie and her husband, Paul. ; Janie opening her special package; Janie performing surgery; Janie Yoo with several of her patients. As an ophthalmologist serving in Zambia, Janie Yoo not only helps patients see physical light but the Light of the World as she shares Jesus’ love every day in her office. She is originally from California, and her husband, Paul, who is a dentist, is from Hawaii. Both are graduates from Loma Linda University. Janie and Paul have been missionaries in Zambia for nearly two years. It Can’t Be Done Volunteer mission service has been a vital part of the Adventist Church since its beginning. well remember my first experience with a volunteer. I was a twelve- year-old missionary kid living in Tanzania in 1964 when Lloyd Logan came from the United States as a volunteer to help at Heri and Kendu Bay Hospitals. Lloyd often came by our mission station so we got to know him quite well. To us missionary kids, it seemed like there was nothing he couldn’t do. He was a great trumpet player and said he got that way by practicing with his trumpet hung from a string so his lips just touched the mouthpiece. He could play any hymn at church and, wow! He even climbed Mt. Kilimanjaro by himself carrying a 70-pound pack. Lloyd was the first recorded student missionary to go to Africa. When he approached the General Conference administration about volunteering, he was told there was no procedure for sending volunteers and that it simply couldn’t be done. However, the General Conference president saw potential in the use of volunteers and was able to work out the details. To Lloyd this was a miracle. You can expect to see his story in an upcoming issue. Initially, volunteers were processed as full-time missionaries because there was no system for recruiting and sending them out. In 1996 the Adventist Volunteer Service (AVS) was established as an arm of the General Conference of Seventh-day Adventists Secretariat. Today the AVS program combines some 800 requests from 78 countries with more than 1,300 volunteers coming from 72 countries. We are truly a global service impacting the world for Jesus. The Thomas family in Tanzania in 1964: Elder Fred and Jean Thomas, and their four children (left to right) Dave, Peter, Fred, and John. Today Adventist organizations with needs can post these opportunities through our system so that those wishing to volunteer can see them and apply. We always have many more needs posted (currently 435) than we have volunteers to fill them, so the opportunity is great. Perhaps you could fill one of these openings! The volunteer demographics have been shifting in recent years. Historically, most volunteers came from North America. Now we see about half of the volunteers coming from other countries. This is the result of a rapid growth in Adventist higher education producing available student volunteers and graduates who are willing to serve. Some of the world divisions and colleges/universities are becoming very active in promoting volunteering. About half of the volunteers are university age with the balance being adult through retirement age. ers. There is virtually no limit to what a volunteer can do! Each edition of Mission 360°will feature stories from past and present volunteers. You will get to read about their experiences, struggles, and joys and see how God is still very active in missionary life. If you have been a volunteer, we want your stories! Please send them to AVSpublications@gc.adventist.org. If you are thinking about volunteering, please visit www.AdventistVolunteers. org for more information. Choose to become an active participant in mission—it is where Jesus becomes real to you and to the unreached thousands. John Thomas is an associate secretary at the Seventh-day Adventist Church world headquarters and the director of Adventist Volunteer Service. Design Student Usually when Boloro wanted something she would smile. But today she was serious. Boloro’s sister is a very committed Christian who knows her Bible. I reminded her that God has promised that if we honor Him, He will honor us, like he did for Shadrach, Meshach and Abednego. But she still thought Boloro was making a mistake. Boloro went to church as planned. After church she received many messages from her teachers and director, saying, “Come to school. We are waiting for you. Hurry!” Her teachers were very worried. They really wanted all their students to pass. At 3 p.m., Boloro’s class teacher sent her a message, “Come quickly! There is still time for you to do your exam.” Boloro replied, “I really want to do my exam but I will come to school after sundown.” At 6 p.m. her diploma teacher called her. This woman was known to be easily angered. “Where are you?” she asked. “I will come soon,” said Boloro. The teacher hung up with an exasperated sigh. Just after sundown Boloro went to school. She was amazed to find that 15 of her classmates had not yet taken their exam although it was already so late. Her friends could hardly believe it. Every year the clothing designers were examined first, and the shoe designers second. “Your God must be a strong God because this year the shoe designers were examined first,” they told her. They were beginning to see what kind of God she had! At 3:30 a.m. , the last student finished her exam. At 4:00 a.m., the students’ results were announced just as the light of a new morning began filtering through the window. Boloro got a B, but more amazing than that, she had her wish. She had done her exam on Sunday. And God had done the impossible for her. Originally from Australia, Coral Camps writes from Ulaanbaatar, Mongolia, where she and her husband, Doug, have been serving as volunteer missionaries since March 2006. Doug teaches cabinet-making skills, while Coral divides her time between being his personal assistant and teaching conversational English to some of the locals. Left to right: Liong Pit Lin, principal health lecturer and cancer survivor; The Healthy Grocery Store sells a wide variety of natural foods. Proceeds from the sales help finance the outreach program; Cooking demonstrations are always well attended; Some of the founding members of Club Sehat pictured with G. T. Ng, far right. Below: Radio health talk show; Bible study class. home. He followed their recommendations and couldn’t help but notice the marked improvement in his health. Later, he attended health seminars at Club Sehat and quit smoking. Today he is a regular visitor and often brings his friends from the entertainment world. Except for the church pastors, all workers in this specialized ministry are volunteers. Their health ministries are lay-initiated, lay-motivated, and lay-committed. The health and spiritual messages are presented side by side, the right hand and the left hand of the message collaborating together. There are no high-pressure tactics. In a quiet and sustained manner, Club Sehat serves its community. Whenever Ellen White’s counsel is taken seriously, God blesses abundantly. The service of Club Sehat testifies to this fact. We praise the Lord for prospering this ministry. Acknowledgments: Arlaine Djim and Irene Tarigan have contributed to the contents and pictures of this article. Arlaine is one of the charter members of the Chinese Ministry Center (CMC), and Irene is one of the health educators of CMC. * Not his real name. G. T. Ng is the executive secretary at the Seventh-day Adventist Church world headquarters. Global N ei g h bo r h ood down with responsibility, it is good to know that we share the privilege of supporting mission work. In some countries the offering is collected by passing a pail, plate, basket, or an ornamental bowl. In other places the custom might be the use of a bag or wooden box attached to a pole. An usher would typically hold one end of the pole to guide the ave you ever had a moment container from one person to the next when it felt as though supportacross a long row of people. ing the mission work of the One visitor to another country Seventh-day Adventist Church was surprised to observe a very inwas a burden? When you thought your ventive method of collection. Two offerings and gifts would barely make a ushers on either end of a row held difference? Depending on where you a long piece of tape. As they moved live, it might even seem like “we” are slowly down the aisle, they carried raising all the money for mission work the tape above the heads of the peo“over there.” ple in such a way that members The good news is that could simply reach up and church members around attach their offering to CAMEROON the globe share the the sticky surface. same eternal values No matter how you do. We want Jewe give, it is a sus to come soon! privilege to supAnd instead of port the mission feeling weighed outreach of the church. When all of us do our part we can make sure that missionaries and Global Mission pioneers can continue to do their special work. Thank you for sharing the privilege. Offering collection at Koza Adventist Church, Cameroon. Cannibalism is not dead. The practice of killing—and devouring—enemies sometimes raises its ugly head even today, even among what appears to be peaceful people. The Adventist Church in Kalimantan has about 8,000 members. Global Mission pioneers form a major outreach force in this area. Sharing the “Gentle Message” in Armenia First official Adventist radio programs broadcast in Armenia. Left to right: Hovik, Joseph, and Gegecik Mkhitaryan work together to produce Armenian programs for Adventist World Radio. The new AWR radio production team in Armenia includes a businessman, a student, and an entire family. From Shepherd of Sheep to Shepherd of Men Alex enjoys tending sheep. As a young man, he worked as a shepherd in the rugged hills of Serbia. On May 18, 1911, two young men stood shivering somewhere in the Caucasus Mountains in what was then Russian Armenia. Frank Oster, 29, and Henry Dirksen, 21, were about to attempt to take the Third Angel’s Message for the first time into the ancient nation of Persia. entering Iran for many Persian-speaking tribesmen lived on the Russian side of the border. There was also a small community of Adventists in Russian Azerbaijan, dating back to 1906. The two missionaries worked with this group of believers who we r e d rawn from across the Caucasus. Oster and Dirksen waited on clearance to enter Iran and finally it came. They headed for the ancient city of Tabriz by way of Tbilisi, the capital of Georgia, which was then part of the Russian Empire and where there was a small group of Adventist believers. They reported: “We spent five very profitable days with our people. . . . The Lord blessed our work, and hearts were melted by the Holy Spirit.” But this was just a brief stop before they moved on. Russia and Persia. In the morning after inspection by the customs officers we crossed in a small open rowboat in the midst of a heavy rainstorm to the Persian border. Here we loaded our baggage on donkeys and went to the automobile station. . . . We were informed, however, that the late rains had greatly damaged the road, so we were obliged, after a two-day’s wait, to drive to the next station.” In Tabriz, Oster and Dirksen “began language studies, and made themselves acquainted with the manners and customs of the people by visiting the villages.” Dirksen returned to the United States, but in 1913 Oster’s wife, Florence, joined him and they settled in Maragheh, a town east of Lake Urmia. Florence put much effort into learning the language, including teaching English to local women as a way of learning from them! from its early days and that continues to inspire thousands to follow in their footsteps in service around the world. Born to missionary parents in India, David Trim is the director of the Office of Archives, Statistics, and Research at the Seventh-day Adventist Church world headquarters. Visit www.AdventistArchives.org. “Is Sammie okay?” I screamed. the chicken had died and they were eating it, but what really happened was that they had traveled up to the hen’s roost, covered her, and killed her. Binyam, our son-in-law, said that they were capable of even killing a small child, so my attention turned back to my little son, Sammie, who had wanted a bottle. He had stopped crying by then, and that is not like him. “Is Sammie, okay?” I screamed to Dinqee, the eight-year-old wonder who reacts better than most teens I know. “Dinqee, ants in the house! Check Sammie and Henock; Hawii is okay!” I yelled, waking her out of the deep sleep she was enjoying at six in the morning. My son Sammie with Dinqee who helped me with the bug extermination. Monica and Scott Barlow with part of their family in Ethiopia. So what had seemed like an awful incident to me really did help us in the long run. her face was beet red and swollen. I ran to my medicine chest looking frantically for some Benadryl but found only Children’s Claritin. The label said that it was an antihistamine, so I gave her a dose. She seemed okay despite her ailment so I decided to fix breakfast and change diapers. I started to feed the babies when I noticed that Hawii was gagging on a pancake. Immediately I panicked, thinking that her airway could be compromised. Running up the hill to the hospital, I tried to find a doctor but all of them were doing patient rounds at the time. Hawii did not seem to be in distress at that point, so I patiently waited. The chaplain saw me and asked what was going on. She rerouted me to one of the other moms on campus who might have some Benadryl to share. I thought to myself, Can’t I have one morning this week where things go smoothly? The mom helped me and reassured me of Hawii’s recovery. As I walked back down to the house, I held my daughter extra tightly. Through her distorted smile, I could see that she was feeling better. On examining the causes of her allergic reaction, only two seemed possible. Either acid bugs squirted their enzyme on the blanket she sleeps on or the very toxic bug spray we used those two mornings was more than she could handle. After receiving a visit from a physician, the reason became clear. The acid bugs were the culprits. After the babies were all tucked into bed, I looked over at my comrade, Dinqee, and said, “Why do you think this all happened to us?” She looked at me and smiled, “I think some of the ants and acid bugs have eaten a few of our cockroaches!” I laughed. So what had seemed like an awful incident to me really did help us in the long run. Immediately I remembered a story from the life of Corrie ten Boom, a Holocaust survivor. She was in a concentration camp with her sister and the living conditions were atrocious. Corrie was upset at God and complained to her sister that she couldn’t understand why God allowed lice to be all over them on top of everything else they had to endure. Her sister looked at her and explained that she had just heard the guards of the camp talking about coming into the barracks and hurting the women, but they didn’t want to go into their barracks because of the lice. Our circumstances were not as dire as what these women had to endure, but the principle was the same. Sometimes the bad stuff in life that we have to endure is actually just the thing that helps us. Thank you, God, for the bugs. You know best! Monica Barlow served as a volunteer missionary at Gimbie Hospital in Ethiopia. She had a myriad of responsibilities, including nurse staffing, malnutrition documentation, VBS and child evangelism. She helped start an orphanage, a street kids program, and an unwed mothers and widows program; organized several surgery projects; and helped build a church in the bush. Although she and her husband, Scott, have returned to the United States, they do short-term mission trips to the Gimbie area each year. How can my church share the good news with our Buddhist community? What are the best ways to share Christ’s love with my Hindu neighbor? How can I explain the hope of the Second Coming to my atheist co-worker? How do I help my Muslim friend understand what we believe? 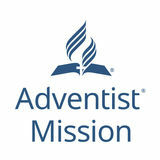 on how to reach people of other religious backgrounds, please visit www.AdventistMission.org. Rick McEdward is the director of Adventist Mission’s Global Mission Study Centers at the Seventh-day Adventist Church world headquarters. py that she had studied French so diligently. Unfortunately, Mary contracted tuberculosis and died when she was 17. She was the first Seventh-day Adventist missionary to give her life in mission service. Adapted from Mary Andrews: Companion of Sorrows by Carolyn Byers. This article originally appeared in the August 2010 KidsView. Used with permission. Photos: Center for Adventist Research at Andrews University. About our cover photo . . .
in this highly populated country of more than 68 million. Church membership is around 540,000. Life is uncertain for countless children who live on the streets. However, citizens remain hopeful and remember that the star in the national flag symbolizes unity and a brilliant future for the country. In addition to this list, more than 100 missionaries are assigned to various General Conference institutions, services, and agencies. Remember when mission work was the most important thing we did as a church? It still is. Every day nearly 1,000 Adventist missionaries serve in more than 200 countries around the world. Some labor in remote villages while others share Jesus’ love in the world’s great cities. Your prayers and support of the mission offering and World Mission Budget help give our missionaries the resources they need to reach millions of people who are still waiting to know Jesus.